A single light cruiser, which consumes far less coal and can, if necessary, coal from captured steamships, will be able to maintain herself longer than the whole Squadron in the Indian Ocean, and as there are great prizes to be won there (Indian, East Asiatic and Australian shipping), it seems advisable to despatch our fastest light cruiser, the Emden, with our best collier. She can subsequently proceed to the African coast, or should Holland remain neutral, to the Netherland East Indies. However, the Dutch decided to ‘rigorously enforce their neutrality.’ On 27 August the Dutch coast defence ship Tromp ordered Emden to stay out of Dutch territorial waters. She had earlier sent away a German collier that had stayed too long in Dutch waters. This meant that the Germans had to abandon their pre-war plan that supply ships should wait for orders in neutral waters. Emden’s coal bunkers had a capacity of 790 tons. She might carry up to 1,000 tons, but her combat efficiency and the crew’s living conditions would be adversely affected by the need to store coal wherever space could be found. At her most economical cruising speed of 12 knots she consumed 60 tons of coal an hour. At the maximum speed that she managed on trials of 23.85 knots she used 371 tons per hour. Thus, with a normal coal load, she had an endurance of just over 13 days and a range of just under 3,800 miles at 12 knots. She could maintain full speed for about 50 hours and 1200 miles. Müller used the following tactics when attempting to capture a merchantman: The commerce raider should not show its colours until the last moment; it should raise the signals “Stop” and Do not use your wireless” along with its ensign; as little use as was possible should be made of searchlights; and the raider should take up a position that made it impossible for it to be rammed by the merchant ship. He also recommended that cruisers employed as commerce raiders should have larger than normal crews in order to be able to provide prize crews for colliers and guards for prisoners. Secrecy was vital for a commerce raider, but the disappearance of merchant ships and reports from neutral ships would mean that the enemy would discover the cruiser’s operating area. Consequently, delaying landing prisoners at ports would help preserve secrecy only if the cruiser had not stopped any neutral ships or if it was operating a long way from enemy signal stations or ports. Emden’s appearance on the Colombo to Calcutta route in the Bay of Bengal surprised the British. They had returned to peacetime procedures, as they had not realised that Spee had detached one of his cruisers. Consequently, her early victims assumed that she was a British cruiser. Müller encouraged this by having a fake fourth funnel rigged. British light cruisers had two or four funnels, whereas Emden had three. Emden coaled at Simular Island off Sumatra on 5 September, narrowly missing the armoured cruiser HMS Hampshire, which had searched there the day before. On 10 September, Emden stopped a neutral ship, the Greek Pontoporos, whose cargo of coal was British, making her a legitimate target. Müller kept her as a collier. Emden had captured five British ships by 13 September. One, the Kabinga, had a US cargo, so was retained as a prison ship. The other four were sunk. The next ship intercepted by Emden was another neutral, the Italian Loredano. Her master, Captain Giacopolo, refused to take Emden’s prisoners on board on the grounds that his ship had insufficient provisions. Müller allowed her to go. She did not have a wireless, but the next day met and warned the City of Rangoon, a new ship carrying a cargo worth £600,000, which did have a wireless. This led to a suspension of trade, which meant that several ships that would probably have been caught by Emden remained in Calcutta: she was then very close to that port. She did, however, capture and sink another merchantman that had already sailed. Müller now decided to change his area of operations. He first sent the Kabinga to Calcutta (now Kolkata), with his prisoners, before heading for the coast of Burma (now Myanmar). On the way, Emden captured and sunk another British ship, transferring her crew to a Norwegian ship on 16 September Müller’s next move, after coaling, was to attack Madras (now Chennai) after dark on 22 September. Some damage was caused to the steamer Chupra and to the town, but the main damage caused by the attack was the destruction of 425,000 gallons of oil in the Burmah Oil Company’s tanks. It also led to an interruption of trade in the Bay of Bengal at 2 am on 23 September, only 18 hours after the previous suspension had been lifted, and to alarm in Madras and the surrounding area. Five people were killed and a dozen wounded. Between 25 and 27 September Emden took six prizes in the area of Ceylon (now Sri Lanka). Three were in ballast, but the Admiralty collier Buresk carried 6,000 tons of Welsh steam coal, the best coal in the world for naval use. Buresk was retained as a collier, four of the ships were sunk and the sixth sent to Colombo with the prisoners. Emden then coaled in the Maldives, before arriving at Diego Garcia on 9 October to carry out repairs. Diego Garcia is still British territory and is now a major US base, but it was then so remote that its inhabitants had not learnt of the war. However, on 12 October the light cruiser HMS Yarmouth sank the Markomannia and removed the Pontoporos from German control. 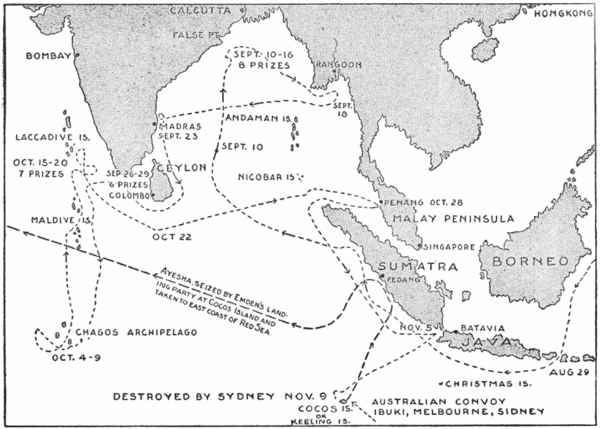 Müller next took his ship back to Ceylon, capturing seven merchantmen from 16 to 19 October. Five were sunk and another sent to port with the prisoners. The sixth, the Exford, was retained as she was another Admiralty collier carrying 6,000 tons of Welsh tons. On 21 October Emden passed within 10-20 miles of Hampshire and the armed merchant cruiser HMS Empress of Asia, but the ships did not see each other because of poor visibility. 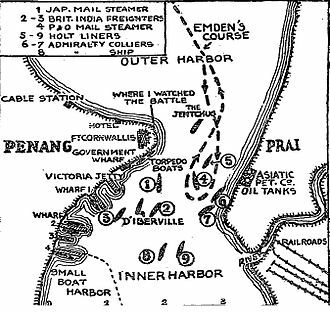 At 5:00 am on 28 October, Emden entered Penang, which had no fixed defences, but was defended by three French destroyers and a torpedo boat. The Russian protected cruiser Zhemchug was also present (3,103 tons, 24.5 knots, 8 x 4.7 inch and 4 x 1.9 inch guns, 4 x 18 inch torpedo tubes): she was smaller than Emden, but not hugely outclassed. Emden was initially assumed to be a British cruiser and did not raise German colours until she was three quarters of a mile from the Zhemchug. Emden then fired a torpedo at her, closed to 800 yards and opened fire. Technical details of warships are from R. Gray, Conway’s All the World’s Fighting Ships, 1906-1921 (London: Conway Maritime Press, 1985). unless otherwise stated. Naval Staff Monograph (Historical) Review of German Cruiser Warfare 1914-1918. p. 4. P. G. Halpern, A Naval History of World War I (London: UCL Press, 1994), p. 74. Gray, Conway’s 1906-1921, p. 157; R. K. Lochner, The Last Gentleman-of-War : The Raider Exploits of the Cruiser Emden, trans., T. Lindauer, H. Lindauer (Annapolis, MD: Naval Institute Press, 1988), p. 307., where the coal consumption is stated to be 60 tons a day at 12 knots. An alternative of 48 tons a day is given on p. 16, but the higher figure is the same as used by Gray. German Cruiser Warfare. p. 7. Lochner, Last Gentleman, p. 73. C. E. Fayle, Seaborne Trade., 3 vols. (London: HMSO, 1920). vol. i, p. 207. Ibid., pp. 209-11. Ibid., p. 213. J. S. Corbett, H. Newbolt, Naval Operations, 5 vols. (London: HMSO, 1938). vol. i, p. 334. See Wikipedia entry linked to ship’s name in text above. <<http://en.wikipedia.org/wiki/Russian_cruiser_Zhemchug>&gt;. Accessed 10 November 2014. P. H. Silverstone, Directory of the World’s Capital Ships (London: Ian Allan, 1984), p. 182. UK National Archives, Kew, ADM 137/10221, ‘S.M.S. Emden: Later Papers’. ‘Account by Officer ex S.M.S. EMDEN of SYDNEY-EMDEN Action 9/11/14’, p. 272 says the landing party was 53 men, with a total of about 60 including boat crews; Lochner, Last Gentleman. says 50, p. 213. ADM 137/1021, p. 273. A. W. Jose, The Official History of Australia in the War of 1914-1918, vol. ix, the Royal Australian Navy, 1914-1918, Ninth ed. (Sydney: Angus and Robertson, 1941), p. 195. Corbett, Newbolt, Naval. vol. i, p. 382. ADM 137/1021, p. 273. Lochner, Last Gentleman, pp. 184-85. Jose, R.A.N., pp. 200-1. Ibid., pp. 188-89. Lochner, Last Gentleman, pp. 279-80. Corbett, Newbolt, Naval, p. 384. Quoted in Lochner, Last Gentleman, p. 207. Corbett, Newbolt, Naval. vol. i, p. 385. German Cruiser Warfare. p. 8. Quoted in Ibid. Just prior to outbreak of war Emden’s chummy ship up the China rivers was screw sloop HMS Clio. Christmas Day 2013 ship’s companies visited each other and the captains were close friends. After outbreak von Muller sent daily signals to Clio saying where Emden had been 2 days before. Thanks for that. A very interesting story that I had not heard before.